Well what a cracker of a Summer, for some of us it has been a little too much, but we really mustn’t grumble, winter will be soon around the corner! We have had a very busy Summer so far, and lots more planned for the rest of this month & September giving riders the opportunity to enjoy all three disciplines. We held our second social of the year, for members and their guests, in early July – a Pud & Quiz evening, hosted by Clive and Rita West – although we would have liked to have seen more members, 20 attended, we had great fun, the puds were scrummy, the quiz produced a barrel of laughs, Heidi Ford entertained us with her SJ prowess and we welcomed some new members to the club, Inge and her partner Craig, who grabbed the opportunity to make new friends and if that wasn’t good enough, the club bolstered its funds by £90. Later in July the club ran another evening dressage – gosh, we were bowled over by the increase in entries, when compared to those held in previous years, so much so, that we declared the event FULL, 20 tests were ridden, incl 4 to music, the latter seems to be growing in popularity and we shall indeed run some more FSM, especially now that the integral arena sound system has now been repaired. We also saw some new riders taking part, which is always a delight, thanks to Jo Lees for judging and Bridget Howse for writing. Just a couple of days after the evening dressage, we ran our first dressage clinic, at Little Park with Katerina Cox, the indoor arena is fabulous, plenty of room and those that attended thoroughly enjoyed themselves and Mike, who oversees the venue took great pleasure in welcoming us there and telling all about the major works going on to improve the facilities, which will include two new outdoor arenas, all at reasonable cost, so we do hope to arrange further clinics there later in the year. 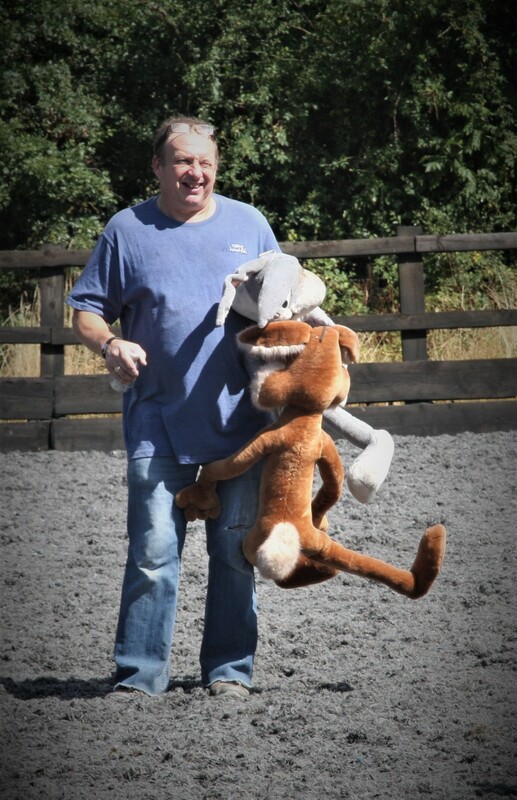 Nic & Mark Lambourne ran another popular Le Trec clinic for the club at the end July, with different obstacles, to test the partnership of horse and rider, I do recall seeing Bugs Bunny at some point! This coming Friday 10th Aug sees another full house at our evening dressage, with yet some more new faces joining us, our thanks go to Kathryn Tudor, show secretary and to Alyce King ( judge ) & Rhiannen for writing. 12th & 25th Aug – XC clinic with Katie Withers. 22nd Sept – Pleasure Ride at Bibury – members and their guest only, full details on website and fb page. 13th Oct – our first ever Riding Dressage Test clinic, Ravensbrook, with Jo Lees, if successful, shall run some more with other judges & trainers. Q: Did you hear about the horse with the negative altitude? This entry was posted in Uncategorized on August 10, 2018 by Simon Kearsley.